Dorothy is pleased to announce that 10% of the proceeds from the sale of all "Barn Maven" series images on display during the ScotiaBank CONTACT Photography Festival will be donated to Whispering Hearts Horse Rescue of Hagarsville, Ontario. The Rider recently spoke with horse lover and regular Rider reader DOROTHY CHIOTTI whose photographic art was on show in Toronto during May’s CONTACT Photography Festival, as part of the Women at Work show hosted by Urban Gallery. In recent years, Dorothy has been focused on developing her creative voice through writing and photography. She is the author of Murder on the High Cs, a light-hearted murder mystery set in the melodramatic world of divas and dysfunction, which was long-listed for the Crime Writers of Canada 2018 "Unhanged Arthur" Award for Best Unpublished First Crime Novel. Dorothy is a prolific writer of poetry and short stories, keeps a writing blog In So Many Words, and has two more novels in the works. Another passion is working with horses. 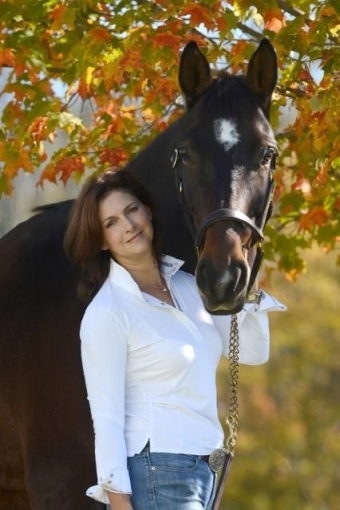 As well as being a nationally certified equestrian coach through Equestrian Canada (retired) and graduate of the internationally-renown training program of natural horsemanship trainer, Chris Irwin, Dorothy is a certified Advanced FEEL (Facilitated Equine Experiential Learning) practitioner with Horse Spirit Connections of Tottenham, Ontario. She is also a student of dressage under the expert eye of trainer, Nancy Smart. Dorothy writes of her life with horses and on the farm at Musings of a Horse Mom. You’re so busy writing novels and blogs, as well as working with horses – what inspired you to pick up a camera and embark on a photographic art career as well? My interest in photography took shape while travelling and easily transferred to my equestrian passion. My family is highly artistic and “painting with a camera” proved to be an outlet for creative expression that resonated with me. My other preferred outlet is writing. What are your favourite photographic subjects and why? I’ve always loved the form, function and spirit of the horse so these beautiful creatures are among my favourite subjects. I’m also inspired by nature and love to capture its mysteries. When travelling, my eye is drawn to the ancient places and sacred spaces of Britain and Western Europe. Their light, shadow, colour, texture and stories capture my imagination. With respect to people, the Barn Mavens series (women working with horses, in barns, etc.) is my first real foray into working with them. I’ve discovered I like the candid approach - there’s truth to it. I think that’s another reason I love photographing horses: every moment with a horse is a moment of truth. You had a horse who literally changed your life – can you tell us about him and how he impacted your life? Shakespeare entered my life at a crossroads - I was 43 and had been forced out of my copywriting job the year before, and was struggling to figure out what to do next. In the meantime, a horse I’d been part-boarding died of cancer, so my husband suggested it was time to get a horse to call my own - a life-long dream was to come true. Shakespeare, a rising four-year-old Hanoverian gelding, and I found each other. I thought our journey was about training and dressage, but it turned out to be so much more. As soon as Shakespeare (or Bear as he was affectionately known) came home I started Chris Irwin’s Train the Trainer course. Those nine months represented the significant first step of my journey to true self-awareness around horses and in life generally. Over the years, Bear was a patient teacher, but in 2011, I was diagnosed with adrenal fatigue and for the next few years had neither the strength nor the stamina to do more than gentle riding. As a result, my interest in dressage fell by the wayside and then in January 2015, after graduating from the life-altering Facilitated Equine Experiential Learning (FEEL) program at Horse Spirit Connections in Tottenham, Bear, now 13, suffered a career-ending injury (torn lateral suspensory) while in an icy paddock. It was a tragic moment in our journey, however the time we spent together while I tended to his wounds and he tended to my heart took our connection to an even deeper level. I found the beautiful Hanoverian mare, Sophi, who was only too happy to help me develop as a dressage rider so Bear had all the time he needed to heal and it was my privilege to give it to him. My amazing boy had helped me to find, and have confidence in, my voice. He’d helped me to believe in myself and go the distance. He was, as they say, my “heart” horse. Shakespeare died suddenly and tragically from torsion colic November 21, 2017, just days after I’d taken his picture for the Urban Gallery exhibit. We had spent almost 12 years together and losing him so soon was something for which I was totally unprepared. I had been so sure we’d grow old together and help people through the FEEL work. Still, it wasn’t to be, and now I honour his memory by living the lessons he so beautifully taught: to be in the moment; to be mindful; to be more in my heart and less in my head; and, in those final days ~ to let go and let be. Naturally, he became one of my chief photographic subjects. Do you plan to exhibit your photos anywhere else this year and, if so, where? A couple of local equestrian retailers have demonstrated an interest in displaying and selling my work and I’m looking into other exhibition opportunities. In the meantime, I plan to expand my focus for the Barn Maven series and get out there capturing more moments of skilled and empathic women working with horses. When I submitted images to the Urban Gallery for consideration last November my vision was just starting to open up. Now, the sky’s the limit. The welfare of the horse is a cause near and dear to Dorothy's heart. She’s pleased to announce that 10% of the proceeds from the sale of all "Barn Maven" series images on display during the ScotiaBank CONTACT Photography Festival will be donated to Whispering Hearts Horse Rescue of Hagarsville, Ontario. To learn more about Dorothy and her photography, please visit www.aimwellcreativeworks.com You will also find a link there to her horse blog, Musings of a Horse Mom. Horses are more secure and comfortable when trailering if they can face the rear, but they prefer openings.